Morgan and Tyler’s Tampa wedding featured a traditional ceremony at Sacred Heart Catholic Church, followed by a ballroom reception in the heart of downtown. “The Tampa waterfront district is so beautiful and unique!” the bride gushed. While the bride thought she could handle most of the wedding planning, she quickly realized the importance of hiring a Tampa wedding planner. With guidance from her wedding planner and the dream decor team of Gabro Event Services, A Chair Affair and Over the Top Rental Linens, the bride created an elegant soft pink, gold and ivory reception, complete with specialty lighting. 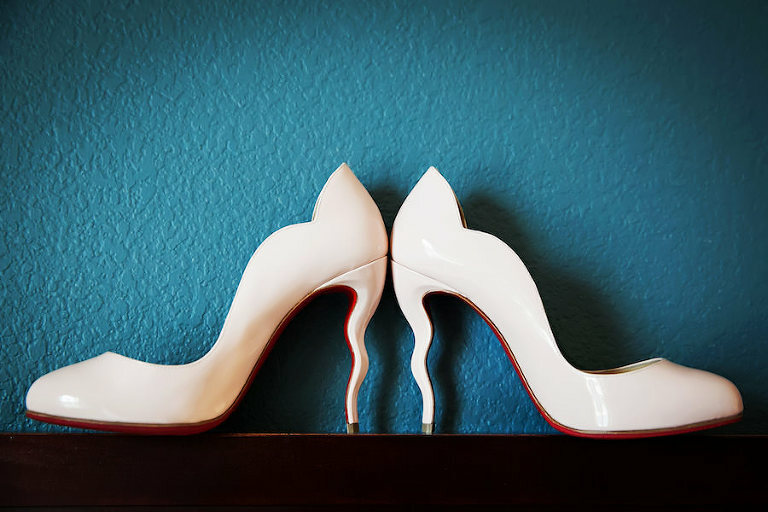 To capture every moment, the bride and groom looked for a professional Tampa wedding photographer who made the couple look natural and unposed. Looking back, one of Morgan’s most memorable moments included seeing her husband for the first at the wedding ceremony. “Our ceremony was so beautiful and created a close bond that we will share for the rest of our lives. 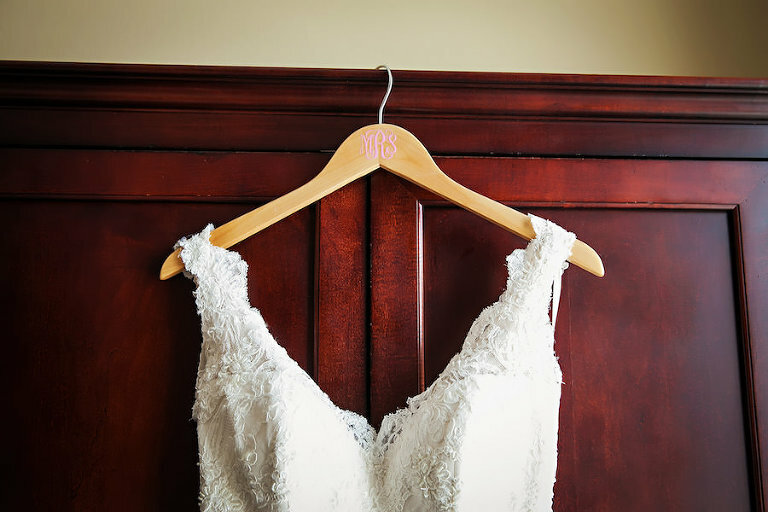 It was so important to me that the sanctity of marriage was the forefront of the message to us and our guests and I believe it was,” the bride reminisced. I purchased my dress at Isabel O’Neil Bridal. Marysabel, the owner, was such an amazing person to work with and our personal coordinator from the shop was so knowledgeable about the industry and helpful in me choosing my dress. It was the best experience working with them. 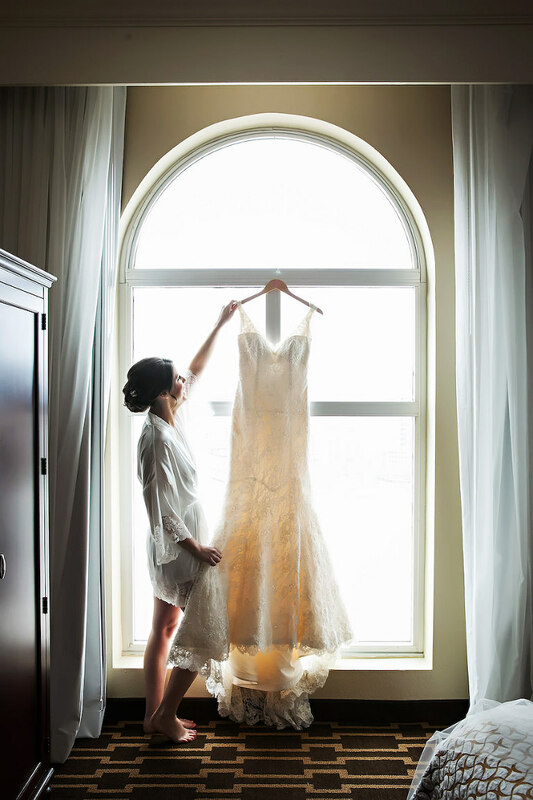 It was intimate and truly the moment I felt like a bride for the first time. I would highly recommend them to anyone looking for a one-of-a-kind wedding gown and experience from day one to walking down the aisle! Originally, I only hired a wedding planner for the “day of” services, because I thought I had the rest covered. I was wrong! Planning a wedding has so many details that need to be attended to, and I was not prepared or equipped to hire some of the decorators and details myself. That job should be reserved for someone who works in that industry every day! I met Jessica Ralph [of Parties a la Carte] at a wedding I was in, just after I had gotten engaged to Tyler. We hit it off right away; it was very important to me that someone had the same method for dealing with vendors prior to the wedding, issues that day of and was just fun to work with, and Jessica was all those thing and more. She took charge of all the details, was there for me every step of the way in the wedding planning and executed a perfect event on the day of! Jessica and her team were amazing, and I would recommend them to anyone looking for a planner of any event! Tyler and I both wanted great quality in a wedding photographer and someone who could capture the quality moments of our day, without us needing to pose the entire night. Limelight Photography has such a great reputation in the Tampa area and their services were reasonably priced with the other wedding photographers we were looking at. When we spoke with Jess Orthober for the first time, we were hooked. She was very receptive to our ideas for the wedding and was able to take our approach and emulate them in her process of taking the photos throughout the entire day. The quality of their photos were also amazing; we could not have been happier with the outcome! What was your decor and lighting inspiration? I wanted to have a wedding reception that was inviting and fun to be a part of, but that people took a step back and said “Wow!” I think we accomplished that with the help of our wedding planner. They helped us choose our wedding reception flowers, lighting and décor for the room. I honestly didn’t realize what all went into that, and was amazed at how much Jessica and her team were able to take my concepts and perfect them. The room was warm and pretty with the uplighting and I loved our GOBO from Gabro Event Services! Our theme was spring time with a blend between garden style and classic looks. I love timeless looks and definitely wanted the groom and groomsmen in tuxes, but Tyler’s was blue, while the other men wore black. I also love tulips and wanted to make sure our decor was dressed up with gold accents and not too busy of a room, minimal candles and only a few major centerpieces. 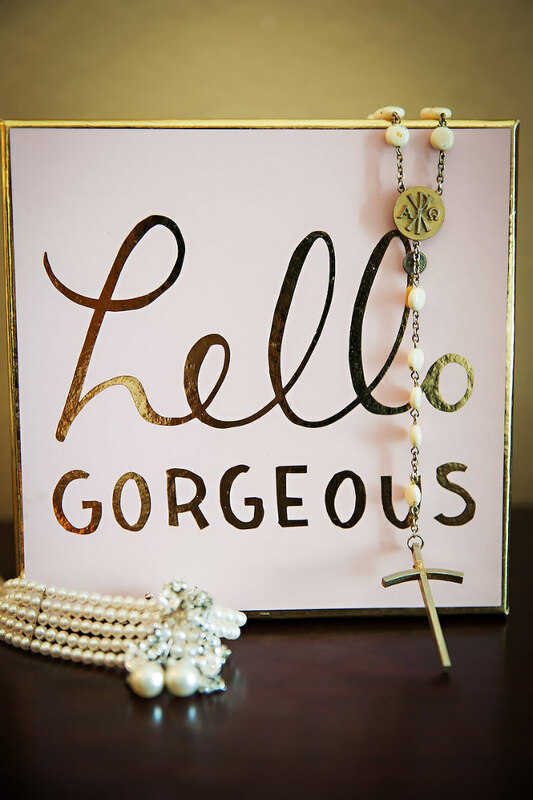 Soft pink, gold and ivory. I love soft pink for a wedding because it is feminine, but not overstated. There are so many beautiful flowers that can be incorporated in to that palette. Tyler proposed in the living room right after the closing of our first home in St. Pete. It will always be a special place and moment and hold so many cherished memories of first things in that home. I wish I would have utilized our wedding planner’s services earlier in my planning. It is a huge undertaking if you are planning a wedding, and they made my mom and my lives so much easier. I just wish we would have worked with them from the beginning!